And thank you so much for giving me the opportunity to host you on my blog today, on your bithday- a very special day! Earlier this year I started a weekly interview post on my blog and one of the questions I ask every guest is, “What book would you like to live inside?” Surprisingly, almost everyone has answered Harry Potter. I agree that living at Hogwarts would be phenomenal. However, I’ve also been thinking a lot about the whole idea of magic in our lives. What is magic? There’s the Harry Potter/ Gandalf wizarding kind, but I’d also like to make the case for a subtler kind of magic that’s sometimes easy to miss. The kind of accessible, everyday magic I find in flowers. And laughter. 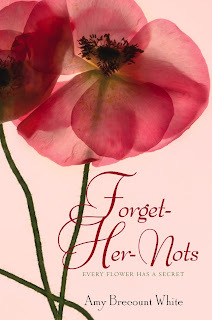 When I was first writing Forget-Her-Nots, lots of people – critique partners and editors I met at conferences - wanted me to make it an all-out, whizz-bang fantasy novel. They wanted flower witches and warlocks and the grand, showy kind of spells. I resisted, because I wanted my novel to have more of a connection to the rhythm of ordinary lives. I want anyone who reads my novel to wonder: is the magic of flowers possible in my own life? In fact, doesn’t it seem kind of magic that more beauty and sweet scents in our lives can make us happier? And now that spring is here, plant a tiny flower seed in warming soil and watch it transform itself out of sun, water, and earth. Just try to tell me there’s not a kind of magic in that! A few days ago, I heard the Dalai Lama laugh in a radio interview. His laughter was infectious, like sweet like bells ringing through me. His personality and his joy rode the radio waves out into the universe. I couldn’t help smiling. Flowers and laughter are the most magical things I know. If there is such a thing as everyday magic, perhaps that’s what novels described as “magic realism” are getting at. There is a magic in our everyday lives, whether we choose to see it or not. Sometimes you have to be looking for something to be able to see it. Lots of readers have told me that they see flowers differently after reading my novel. They are more attuned to the transformative possibilities of blooms. Yay! So what’s magical in your life today? Thank you so much, once again Amy! 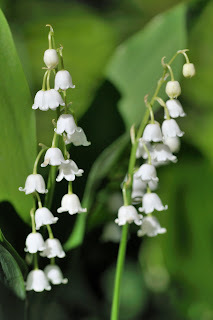 Dear followers, like they say in FHN, "Every flower has a secret"; Today I offer to you Lily of the Valley. I hope happiness returns to you all. After this dreadful weather we've had so far I think we could all use a breath of fresh air!